Sadie's a straight A student, with a wealthy family. She strives to achieve her best, and being the best means entering the Mind Corps Fellowship Program. The Program is designed for interns to enter troubled teen's minds and Sadie is assigned Subject 9 - Ford Winter. Right from the start he fascinates her, and slowly she falls in love. Sadie finds herself questioning whether she has to protect Ford, even if it means ignoring the fact he's committed a murder. Minders started off by being straight to the point, which I loved. Jaffe introduced the characters and the world, whilst also outlining the central focus in the initial chapters. It meant that I wasn't given useless chunks of information that distracted from what I was suppose to concentrate on. It didn't mean though, that there was sparse development with the characters or the world. In fact, I found a lot of depth in the world building and everything I learnt was fascinating. The characters weren't all fully developed but at least there were some interesting aspects to them. I loved learning about Ford, and his mind. This was the strongest point of the novel - having Sadie in Ford's mind. Her observations were both intriguing and actually very realistic. I really liked that Jaffe aligned every emotion with a certain taste, and drew out an image of the mind creating dots of images for Sadie to see. She could also move around and enter different levels of his mind. It meant that I got to know a lot more about Ford in a first hand encounter, without it being really told through his perspective. However, that meant that I didn't get enough from Sadie. Instead, I felt like she was the typical perfect student/daughter but underneath had more of a wild side and playing by the rules wasn't always right. It felt like she was just a vehicle to drive the novel and I don't think I really cared about her. The other characters were stayed on the edges and whilst they had their roles, didn't really impact on my reading experience. The let down was that both the ending and the romance just came across really rushed. I couldn't believe the love Sadie started to feel for Rush, or at least the intensity that came from it. I mean it's possible that she liked him, but this was so much more. I didn't understand why Jaffe had to add a boyfriend to the story either. I mean he did nothing for the plot and Sadie didn't even think about him for most of the first half. He just made an appearance here and there without really explaining anything. The ending was crammed with so much information that was suppose to answer the major questions, but when I read the final page I immediately thought "is that it?" I was so confused. The conflict was so major and yet, the ending felt so lacklustre in comparison. The epilogue didn't do much good either. I think it's cause I waited so long for something to happen between Sadie and Rush but it felt like nothing did. Neither did I get a final answer for the other characters. This really frustrated me in the end, and that's why I couldn't bring myself to give it a higher rating. It was definitely a very enjoyable and fascinating read, but whilst it had so much potential, it wasn't exactly delivered quite right. I do think Jaffe has great writing skills though. She's written a number of novels in different genres and seems to have pulled them off. 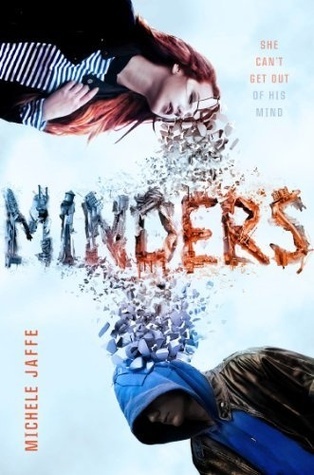 Minders is no exception with solid writing and fast paced plot - it just lacked a little here and there. This sounds a little like Reboot in a lot of ways, and at first I couldn't connect with the main character in that either. So many YA science fiction with female protagonists tend to portray them as pretty cold actually. But her seeing into someone else's thoughts sounded like it sacrificed Sadie's storyline, I don't think I'd be able yo connect with her either. Which is a shame because the premise sounds really good, apart from the romance. Probably the whole 'got a boyfriend, forbidden don't touch romance', it could have done without. Oo, I don't think I've ever heard of that before, but I shall check it out! Yeah, like Sadie was still a distinguishable character, but she just didn't have much depth. And I definitely agree with you on the romance bit, she didn't have a boyfriend for the entire novel but when she did it was like they weren't together anyways.